Nam-Myoho-Renge-Kyo, The Mystic Law, The Lotus Sutra title…whatever you may choose to call it, this life-changing philosophy has secret powers which, when utilized in our daily lives, can help us change not only ourselves and our environment but also help make this world a peaceful and friendly place to live in. Chanting Nam-Myoho-Renge-Kyo helps all people to achieve enlightenment, which is the ideal of the Lotus Sutra. Therefore, this enables us to activate our inherent Buddha nature and eventually manifest it as the life-state of Buddhahood. As we chant Nam-Myoho-Renge-Kyo, we are able to bring forth the inherent wisdom of the Buddha, from within us. We can then direct our knowledge & talents to creating happiness for ourselves and others. As we gain this wisdom, we create compassion, within us, for self and others. When We change, the world changes! Therefore, the key to all change is in our own inner transformation—a change of our hearts and minds. When we chant Nam-Myoho-Renge-Kyo with unshakable Faith, it empowers us to transform even our deepest of Karmas! This is for the reason that we become enables to bring forth our innate Buddhahood and our extreme potential, in this lifetime and beyond. Those who hear & chant Nam-Myoho-Renge-Kyo are like in Winter. They have their own life struggles but they will never recede into an ordinary person who may succumb to life’s challenges. They will surely progress to attain Buddhahood, and hence, “Turn Winter into Spring“! Any unfavorable situation can be changed into a source of value. Therefore, when we approach life’s challenges as an opportunity to reflect on ourselves & to strengthen and develop our courage and compassion, we are successfully able to ‘Change Poison into Medicine’. That’s how we grow as human beings! No matter what problems we may face, as we chant this powerful Mystic Law, the dawn will always break, fine weather will always return, and spring will never fail to come! We must always chant with our entire potential and deep unshakable Faith. Chant without Doubt! That is when we will realize “Nothing is Impossible for those who steadfastly chant Nam-Myoho-Renge-Kyo”. As we chant powerful Nam-Myoho-Renge-Kyo, we will witness that all our prayers serve to propel us in the direction of our supreme happiness. Even if our prayers didn’t get realized the way we wanted, when we look back later on, we will understand that everything turned out the way it did for our very best. 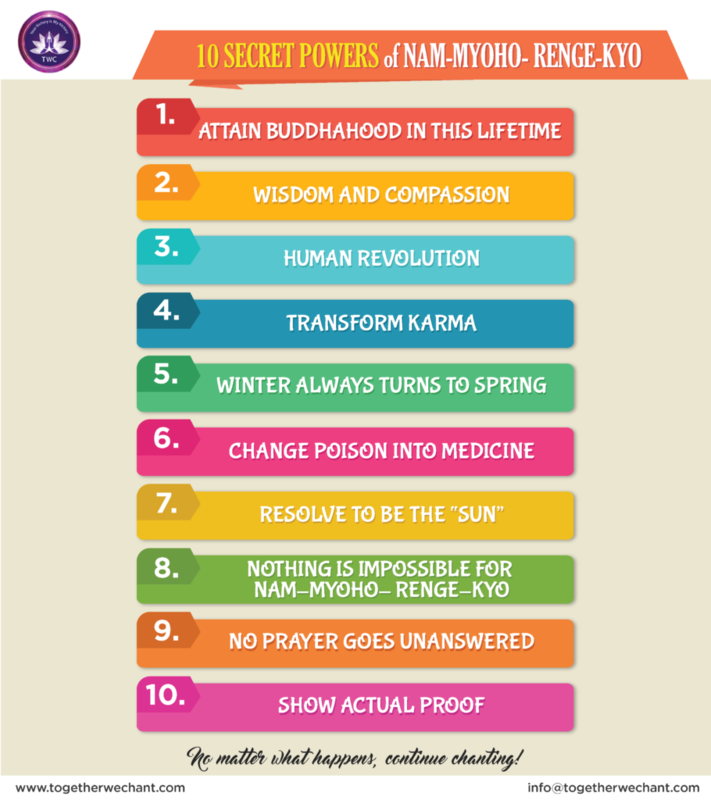 Last but not the least, chanting Nam-Myoho-Renge-Kyo daily helps us to develop the Courage and Strength to fight every challenge & obstacle head-on!! We are determined to show Actual Proof of our victory and eventually, share it with the world through “our own success story”. No matter what happens, continue chanting Nam-myoho-renge-kyo! This article is inspired by my own experience as a practitioner of the Mystic Law over the last few years. Any similar information available online may just be purely coincidental. Awesome! Continue chanting Nam Myoho Renge Kyo. You may want to go to SGI’s official website and contact them there, to help you connect with your local district. Thanks.